Well guys, after losing our minds over the fact that Kelsy Karter got a tattoo of Harry Styles on her face, we just found out that the dramatic new ink is actually fake! That’s right guys, we can all take a deep breath. The New Zealand pop star just uploaded a YouTube video revealing the truth behind the tat, and it turns out, it was all a ploy to get attention for her new single! The 25-year-old explained that her manager encouraged her to write a song about Harry instead. 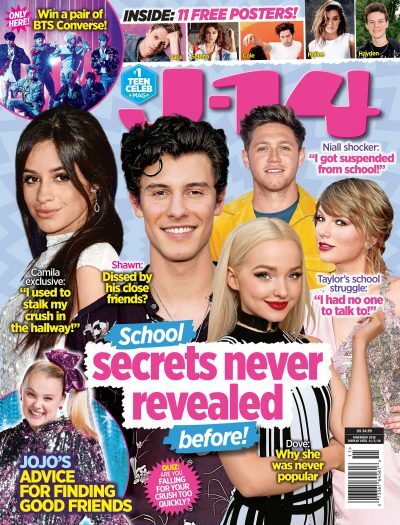 J-14 readers know that the singer has never been shy about her love for the One Direction member — talking about him in interviews and tweeting about him non-stop — so it wasn’t hard for her to take her love for the 25-year-old and put it into a song. And when Kelsy realized that Harry’s birthday was approaching at the beginning of the year, she decided it was time to release the tune. When the news of the ink first broke, the singer claimed that she had gotten it tattooed by celebrity tattoo artist, Romeo Lacoste, who’s worked with Ariana Grande and Justin Bieber in the past. The artist even shared snaps of what appeared to be him adding the ink to her face, needle and all, so yeah, it was definitely believable! Girl, you seriously got us. Well, as mad as we are that she tricked us, we’re not going to lie, it was definitely a smart move! We definitely won’t fall for this one ever again.